Are you someone who liked to do fun science projects in school? If you are, then you may find that old rusty tools can be cleaned by using the power of electricity. A battery charger is the source of the power that is needed for the electrolytic rust removal process. 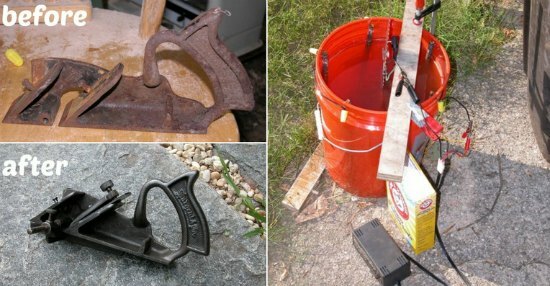 You will be using a five-gallon bucket for the electrolytic rust removal process. The rust that is on tools or other metal objects is easily removed without too much extra effort. A metal brush will be needed to remove the leftover debris to expose the rust-free metal. This is the only part requiring manual labor. The hardest part of the electrolytic rust removal process is the setup. There are many steps to do before you can begin the process or removing rust from metal. Safety is the most important part as you will be using electricity that can be dangerous if you do something wrong.